The view north on Carson Street, seen from Telegraph, shows a great number of signs that look very similar. Maybe they all used the same sign company? 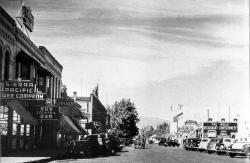 From left to right we can see signs for Sierra Pacific Power, Ed's Cocktail Bar, Muller's Drugs, the Capital Bar, Arlington Hotel, Larry Moore's Coffee Shop, and the Fountain Restaurant.